Yesterday was Valentine’s Day. A day of love and happiness, often symbolized by Cupid, chocolate, and of course hearts. Just about everything you can imagine can be found in a heart shape for Valentine's Day. While heart-shaped objects are expected within this context, it is not something you expect to see when taking a picture of the inside of someone’s brain. But that is exactly what two neurologists from Baylor School of Medicine found when a 27-year old man underwent a brain MRI (magnetic resonance imaging) scan. The picture to the left shows an axial slice of the brain, which is a top-down view. The heart shaped lesion (abnormal area) can be seen on the bottom. The picture to the right is a saggital slice of the brain, meaning it shows the brain from the side. The heart-shaped lesion is clearly visible in white towards the right of the image. So what are these heart shaped areas? They are areas of inflammation caused by an inflammatory condition known as neurosarcoidosis. Headache is the most common symptom but seizures can also occur. 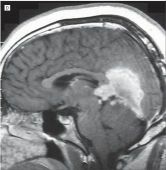 Both occurred in this patient. The final diagnosis in this case was made upon a biopsy. The condition is treated with medications that reduce inflammation (corticosteroids) such as Prednisose but chemotherapy drugs or medications that suppress the immune system are used in some cases that do not respond to corticosteroids. The reference for the study is: Suárez Zambrano GA, Hutton GJ. (2008). 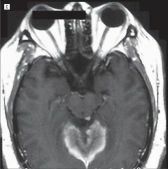 Heart-shaped lesion secondary to neurosarcoidosis.Arch Neurol. Oct;65(10):1388-9. The images are copyrighted by the American Medical Association.